President-elect Donald Trump nominated Sen. Jeff Sessions from Alabama for Attorney General and Rep. Tom Price from Georgia as the new Health Secretary. Those appointments still require Senate approval before they are officially members of the cabinet. Neither of the picks to head the Department of Justice (DoJ) and the Department of Health & Human Services (HHS) is friendly to cannabis. Both of those agencies are at the center of any federal regulation of cannabis, including access for research. As Attorney General, Jeff Sessions would essentially have the ability to block any rescheduling efforts, as outlined in the Controlled Substances Act. Sessions has made inflammatory, racist remarks and showed his disdain for cannabis users on multiple occasions. He disgracefully said at a Senate hearing in April, “Good people don’t smoke marijuana.” When he was a federal prosecutor, Sessions was a prominent advocate for the War on Drugs, and perhaps even still is. 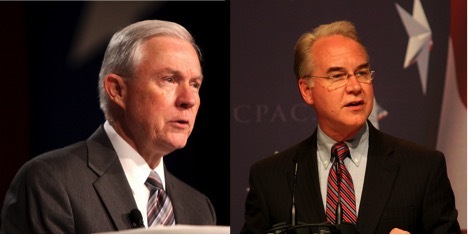 Tom Price, a Republican Congressman from Georgia, has voted repeatedly against pro-cannabis legalization bills, including twice against the Veterans Equal Access Amendment as well as the Rohrabacher/Farr Amendment, which “prohibits the use of funds in the bill to supersede State law in those States that have legalized the use of medical marijuana.” NORML’s Georgia Scorecard gave Tom Price a D grade for his previously voting against pro-cannabis bills. While Sen. Jeff Sessions is certainly no friend to legal cannabis, I believe he is not a serious danger to the cannabis industry. This op-ed on CNN does a terrific job at summing up Sessions’ potential threat to the cannabis industry, but also why it may not be cause for a total panic. The author mentions a laundry list of DoJ priorities over cannabis, but I think the larger issue at hand is states’ rights. Republicans are historically passionate when it comes to keeping states’ rights sovereign. With cannabis’ big wins on Election Day, a majority of the country’s population now lives in states where cannabis is legal. There is too much momentum behind legal cannabis for a new administration to waste precious resources and time on trying to disrupt it. States are getting too much tax revenue from regulating cannabis to just let the DoJ interfere with their economies. “Voters in 28 states have chosen programs that shift cannabis from the criminal market to highly regulated, tax-paying businesses,” says Aaron Smith, executive director of the National Cannabis Industry Association (NCIA). 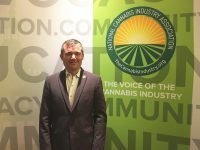 “Senator Sessions has long advocated for state sovereignty, and we look forward to working with him to ensure that states’ rights and voter choices on cannabis are respected.” Smith’s words in the NCIA statement are pointed and clear: this is a states’ rights issue at heart and they must respect that. By forcing the states’ rights issue to the front, it is possible to put legal cannabis in a bipartisan lens, thus eliminating the possibility of a few old drug war stalwarts disrupting the industry. While rescheduling efforts could be thwarted for the coming years, I have faith that the federal government will not interfere with states that legalize cannabis.